My DNA Match with Nicholas Roccaforte encourages me to "Invite Nicholas Roccaforte to Add a Family Tree." We are DNA cousins. I have several Roccaforte ancestors. I would like to help you build a family tree so we can figure out how we are related. I am a professional genealogist but I am offering my services to you for free because we are related. I hope you will allow me to build your family tree so we can both figure out how we are connected. My great grandfather, Anthony Cimino came from Carlentini and his wife, Maria Ossino came from Lentini. They went to Omaha where their family was living. What was the name of your father and mother? I can look them up in the 1940 census and passenger lists. I was able to find a 1953 passenger list which appeared to show Concetto Roccaforte traveling back to Sicily. In 1953, he resided at 37 Bayview Ave, Norwalk Connecticut. 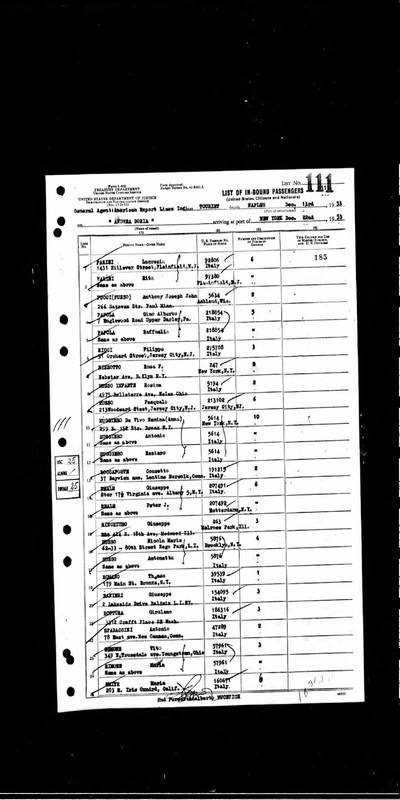 The 1953 passenger list appeared to show that he was either traveling to Lentini or he was born in Lentini. He was on the Andrea Doria in Tourist Class in December 1953. 1953 Passenger List for Concetto Roccaforte on Line 13 for the S.S. Andrea Doria. 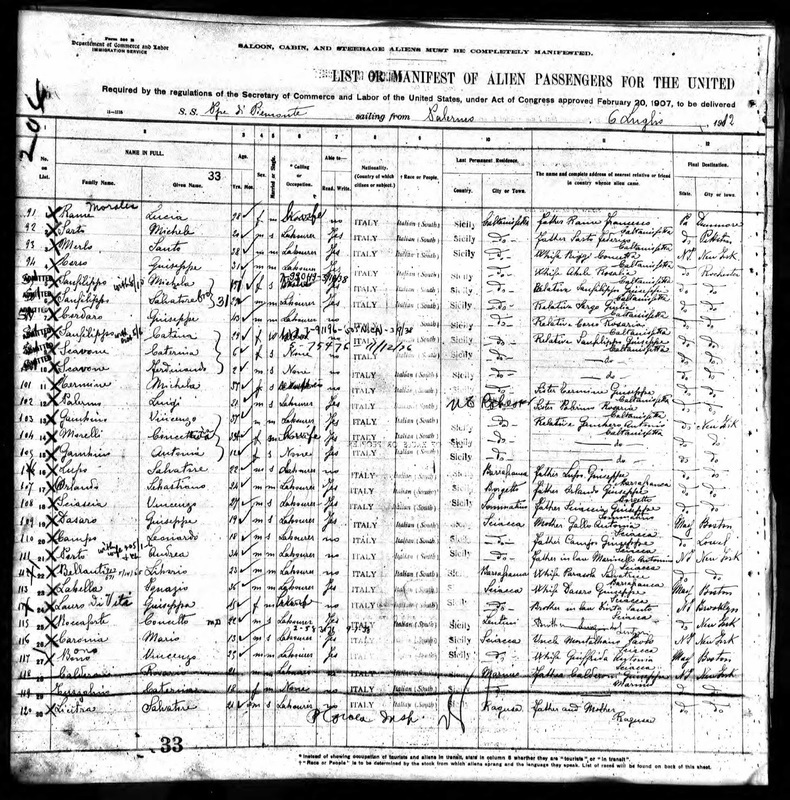 Further research led to the original passenger list which shows when he first arrived to the immigration station at Ellis Island. In 1912, Concetto Roccaforte traveled from Sicily to New York on the S.S. Principe di Piemonte. The ship sailed from Palermo on the 6 July 1912 and arrived in New York on 20 July 1912. The ship had originally sailed from Genoa on 4 July 1912 and had hundreds of passengers already on board when it arrived in Palermo. In addition to Italians, there were lots of Greeks and Turks on the ship. 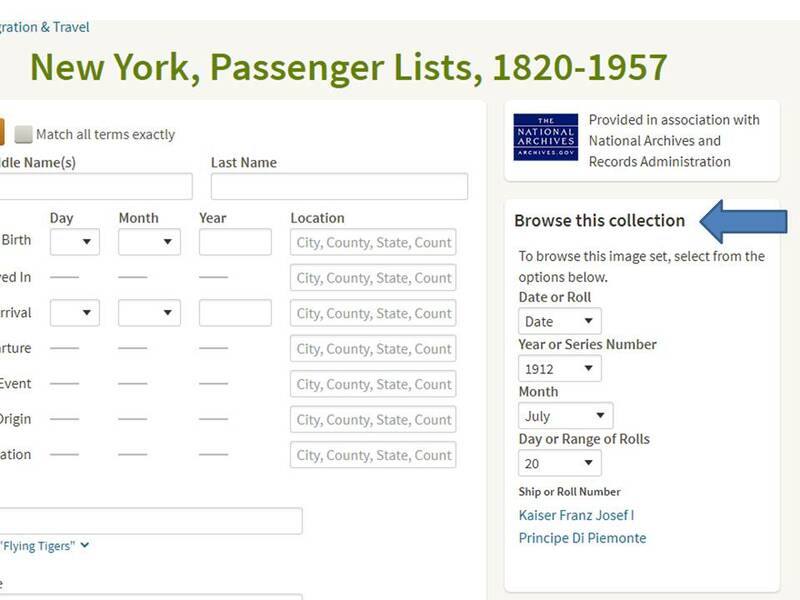 It took considerable effort to locate this particular passenger list as it is not indexed on Ancestry.com. The name of the ship and the date of arrival was identified on the Petition for Naturalization. I had to browse the year 1912 for the passenger lists, then the month of July and then arrivals on the 20th and finally found the passenger lists for the S.S. Principe di Piemonte. 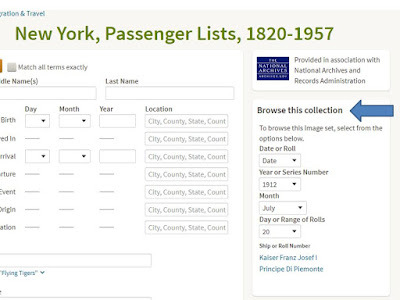 There were 171 images from this passenger list and Concetto Roccaforte was found on image 130. 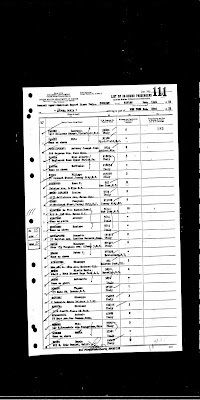 The passenger list shows Concetto Roccaforte on line 25 of the Ancestry.com image number 130 of 171 for the S.S. Principe di Piemonte. There also appears to be a grease pencil number 204 in the upper left of this image. Concetto Roccaforte is listed as age 22, single, male, last residence: Lentini. The name and complete address of nearest relative in Sicily is: a brother in Lentini but the name is hard to read. 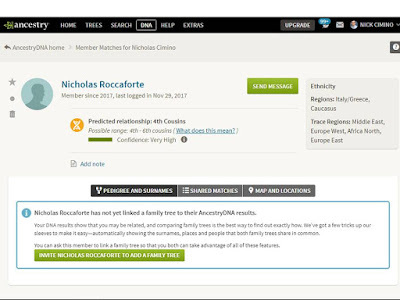 It looks like it begins with an L. The middle name of Nicholas Roccaforte is Lorenzo and that looks like one possibility for the name of the brother. Concetto Roccaforte was bound for New York, NY. 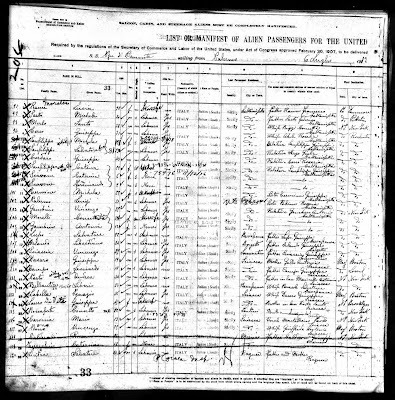 1912 Passenger List showing immigration of Concetto Roccaforte on Line 25. Concetto paid his own passage to New York. He was planning to join a cousin named Alfio Valenti at 326 E. 26th Street in New York. His personal description for height was 5' 2" fair complexion brown hair and brown eyes. His birthplace was Lentini. it shows where the Roccaforte surname appears with a blue arrow. 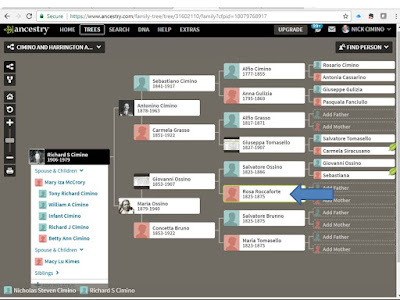 More work needs to be done but it seems likely that my Rosa Roccaforte on the family tree above was possibly a sibling of the father of Concetto Roccaforte. A visit to a Family History Center will give me access to all of the civil registration records for Lentini. Stay tuned for an update on this case.